Accurately track incoming and outgoing shipments, logistical information, or inventory with the Winholt RDWNSS-1 stainless steel wall mount receiving desk! This receiving desk attaches directly to your walls so that it can be placed away from the flow of day-to-day work while still providing a durable writing surface when needed. Pencil and paper compartments provide convenient storage areas while the slanted writing surface gives a comfortable place for your staff to take down notes and records. 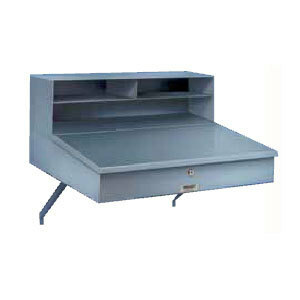 And thanks to its stainless steel construction, you can be sure this durable desk will stand up to years of use.